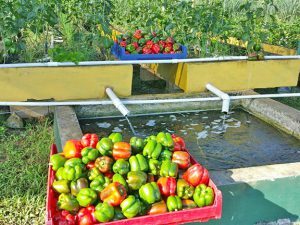 Home › Announcement › Interested in Aquaponics in Jamaica? 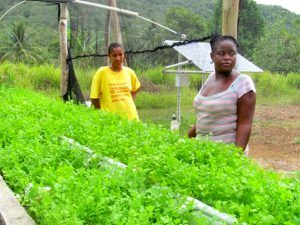 Interested in Aquaponics in Jamaica? Fill out and submit an inquiry on our web site: http://inmed.org/where-we-work/jamaica/. Sustainable food systems pose one of the greatest developmental challenges of the next generation. To address the challenge, INMED has developed a modular form of aquaponics, an innovative food production technique that combines fish farming with hydroponics (soilless crop production). INMED experts have modified the technique using “off the shelf” local materials, making it inexpensive and more accessible to impoverished families and communities. One basic system will yield enough produce and fish to feed a family of four with enough left over to sell for additional income. The 21 systems that INMED has installed to date have supported over 100 farmers, educated 3,700 children, and provided food for over 5,000 individuals (including the farmers, youth, and buyers). What do you think? Is aquaponics the future of farming in the face of global climate change?